Chile beat Argentina in the Copa America final on Sunday night, in part because of Lionel Messi’s missed penalty kick. Afterward, a downtrodden Messi said he’s likely done playing for the Argentine national team after coming up short yet again. But before we all start talking about how Messi might be right to leave the Argentine national team, let’s realise that this declaration was more likely frustration that boiled over into making a harsh, grandiose statement in the heat of the moment. Anybody would be seriously upset if they lost a fourth straight final, especially if you’re arguably the best player in the world and one of the greatest of all time. 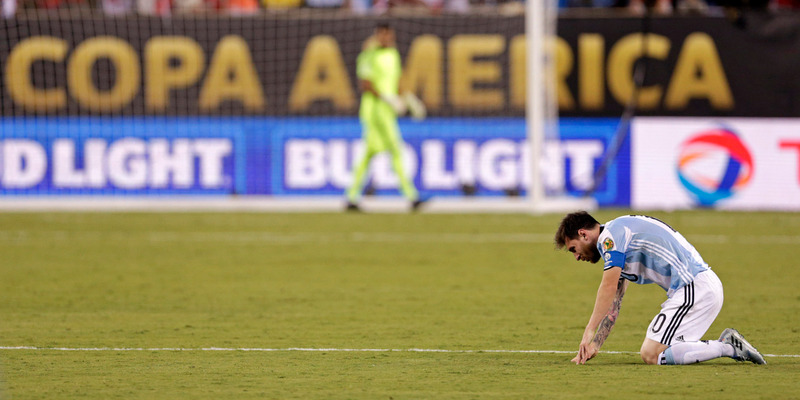 It’s somewhat far-fetched to believe that Messi’s totally done with the national squad. He’s only 29, which is hard for some people to believe considering he’s played for so many years. If Messi quits now, his world-class resumé will have the blemish of never winning a major title with Argentina. Also, Messi has had serious qualms with the AFA (Argentine Football Association), and with good reason. Messi’s chances of helping Argentina break its major title drought aren’t helped when the governing body is embroiled in a corruption scandal. FIFA recently took over AFA following a presidential election that ended tied at 38-38 (meaning, curiously, there were 76 votes) when there was supposed to be 75 voting members, leaving the AFA with no president. The AFA is also close to being barred from FIFA for this rampant corruption in the governing body. As Deadspin’s Barry Petchesky noted, it’s possible to view Messi’s possible retirement as a message to AFA — clean up your act, or you’ll be without me. Messi is undoubtedly allowed to be upset and frustrated, particularly with the way his team’s played over the past four finals. Whether it’s been poor defending or a failure to convert chances (looking at you, Gonzalo Higuain), it occasionally seems as if Messi’s the only one trying on the field. However, considering Messi’s age, and that the World Cup just around the corner, it’s difficult to imagine soccer’s biggest star sitting out a major international competition. Messi still unfairly takes the brunt of the criticism to lead his country to a title, and that’s ultimately why he’ll still return to the team to try and prove his doubters wrong.